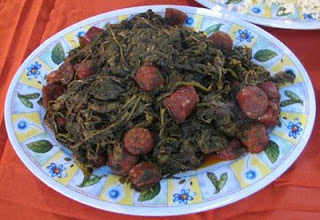 In spring, certain tender greens, both bitter and sweet, are picked to make tsigarelli, a dish of blanched greens sauteed with onions, herbs, olive oil, and—traditionally—reddened with paprika or chile pepper. Today the dish has been modified considerably and is more likely to get its color mainly from tomatoes. Tsigarelli is not exclusive to Corfu—it is found throughout the Ionian Islands, and, indeed, stewed greens are popular in many other parts of Greece. 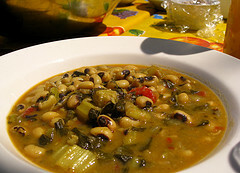 One thing unique, though, about the greens in Corfu, whether simply boiled as for salad or cooked for tsigarelli, is that they are always served hot. An old acquaintance, Nico Manessi, a Corfiote by birth, remembers this dish from his childhood and acted as my gauge when I tried to replicate the recipe. One should look for tender greens. Most local cooks prefer bitter young greens, but today there seems to be no rule of thumb. Tomato paste is added in the modern-day rendition of this dish, but traditional island cooks use paprika to lend red color and cayenne to spice it up. 1. Steam or blanch the greens until wilted, then drain completely. 2. Heat the olive oil in a large skillet and cook the onions, stirring, over medium heat until soft, 5 to 7 minutes. If using sliced fennel bulb and seeds, add them here and wilt together with the onions. Add the garlic, tomato paste, and paprika and stir for about 3 minutes. Add the wilted greens, dill, and wild fennel leaves (if using), and simmer over low heat, uncovered, until the greens are soft and all the pan liquids have cooked off, about 20 minutes. The dish should be fairly dry. Adjust the seasoning with salt and cayenne and serve either hot or warm. Pour a little fresh olive oil over the greens once they are cooked, if desired.